Drill ready epithermal Ag-Au Replacement Deposit. Hole CC-2: 6.1m at 4.5 ounces/ton (155 grammes/tonne) silver from 30.5m depth. Hole CC-6: 3.0m at 4.8 ounces/ton (165 grammes/tonne) silver from 16.8m depth. Hole CL-15: 7.6m grading 4.8 ounces/ton (165 grammes/tonne) silver from 82.3m depth to the base of hole. A number of holes ended in mineralisation or did not reach the target depth. Grades were likely understated due to loss of fine silver-bearing sulphide minerals during the RC drilling programme. Fifteen Lode claims (310 acres) on BLM land, 100% owned by Westgold Inc.No underlying equity of royalty interests. 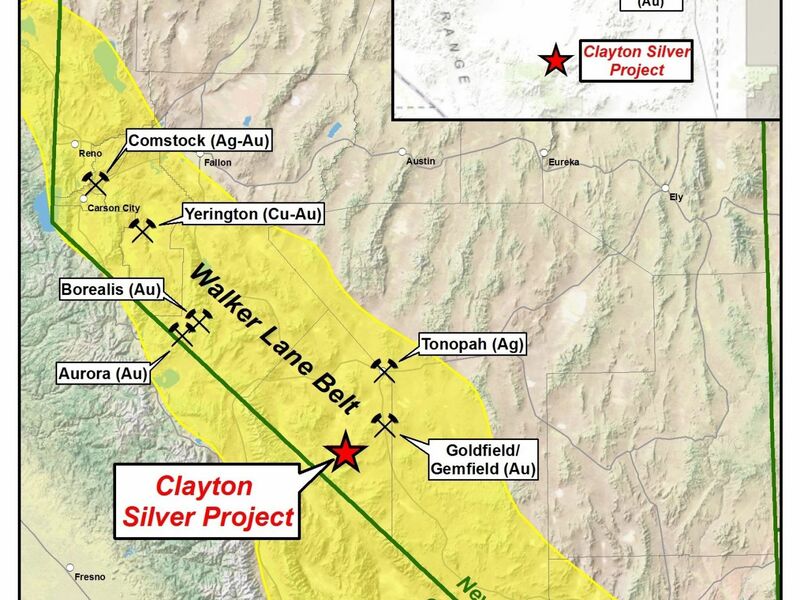 The Clayton Silver-Gold Project is located in the Walker Lane Mineral Belt, a major zone of structural dislocation running parallel to the Nevada-California border that includes a large number of epithermal gold and silver deposits and porphyry copper and molybdenum and copper skarn deposits, including the famous Comstock gold and silver deposits and the Yerington porphyry copper deposits. 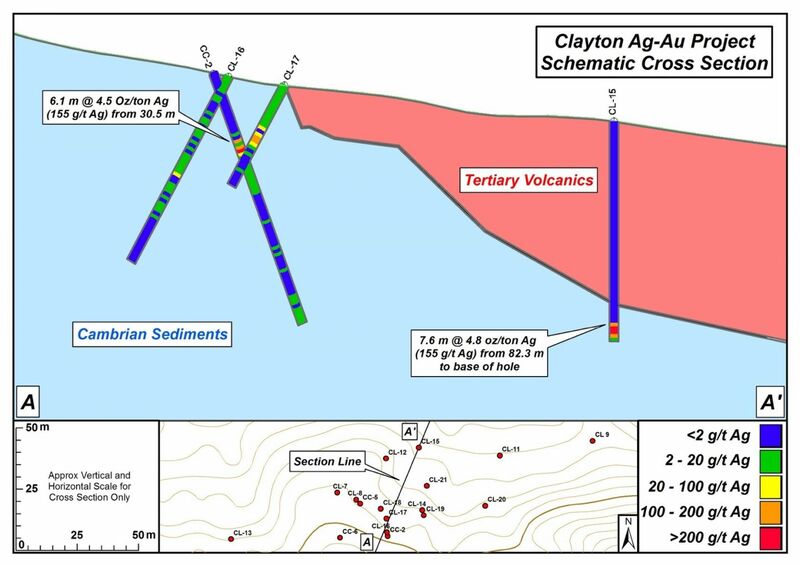 The property lies at the south end of the Clayton Valley, a major centre of lithium brine production. It is some 19 miles southeast of the producing Mineral Ridge Gold Mine, 19 miles southwest of the major historic mining centre of Goldfield where a number of large gold-silver deposits are currently under development and 40 miles southwest of the famous silver deposits of Tonopah which produced over 138 million ounces of silver and 1.5 million ounces of gold from 1900-1921. 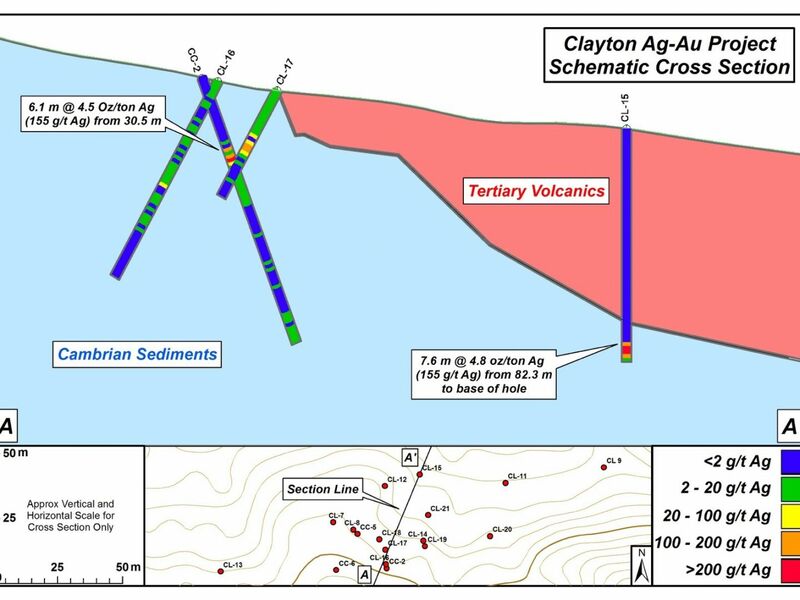 The mineralisation at the Clayton Project was discovered by prospector Ed Tomany under a grubstake agreement with Freeport McMoRan Limited. Surface samples assayed up 5.4 grammes/tonne gold and 265 grammes/tonne silver in a window of Cambrian age sediments outcropping through a cover of Tertiary age volcanics. Fifteen drill holes (CC1-6 and CL7-15) were drilled by Tomany and Freeport in 1987 within an area of about 500m x 350m. 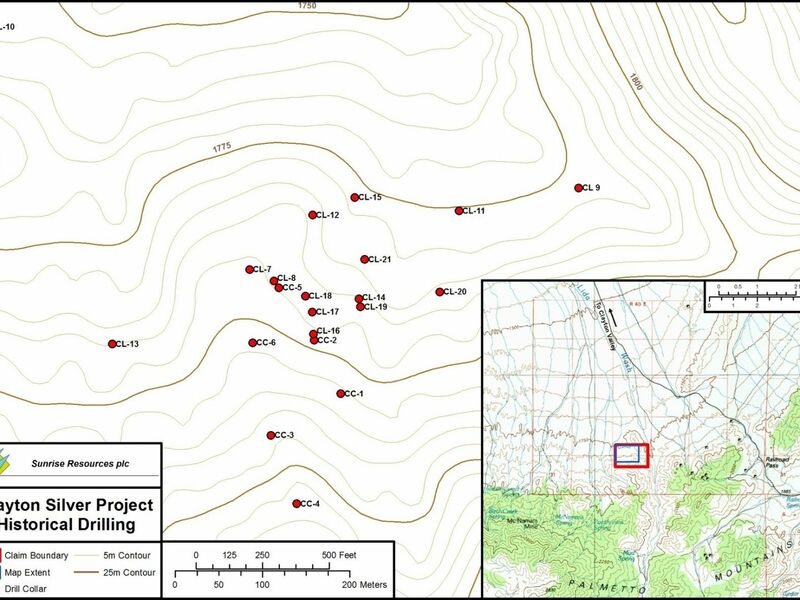 A number of holes (highlighted above) intersected significant silver mineralisation within a zone of extensive brecciation and silicification believed by Freeport to represent the high levels of an epithermal system. True thicknesses of mineralisation are not known. Mineralogical evaluation of drill samples and the results of screen gold and silver analyses were interpreted by Freeport to indicate that silver occurs in association with fine grained sulphide minerals that may have preferentially been lost from the drill samples into the drill fluids and that the reported silver grades are likely to be understated. The intersection in Hole CL-15, one of the most northerly holes drilled by Freeport, was of particular interest, the hole having been abandoned in good-grade silver mineralisation due to difficult drilling conditions. In addition, gold values were increasing towards the base of the hole (3m grading 0.75 grammes/tonne gold at end of hole). Freeport geologists recommended a programme of diamond drilling to obtain more representative samples of the mineralisation, but this work was never carried out due to a shift in corporate focus away from silver. 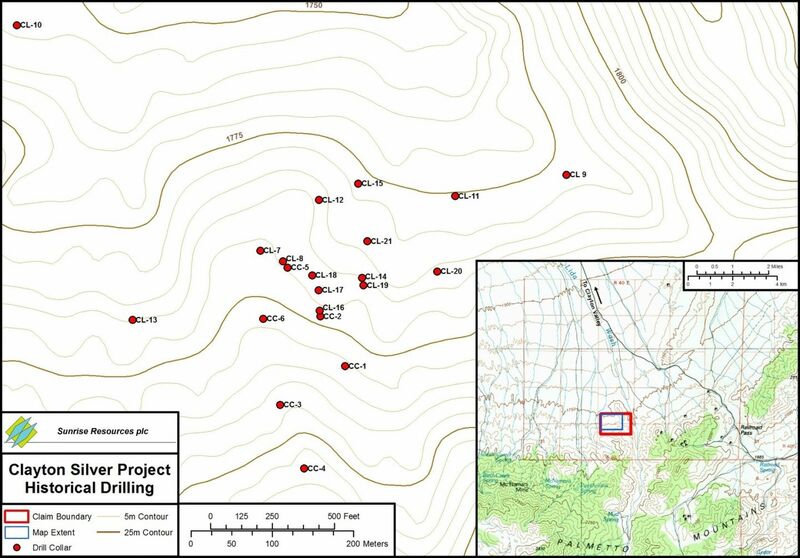 In 1989 Coeur Exploration drilled a further 6 shallow RC holes (CL-16 to 21) in the central part of the project area. 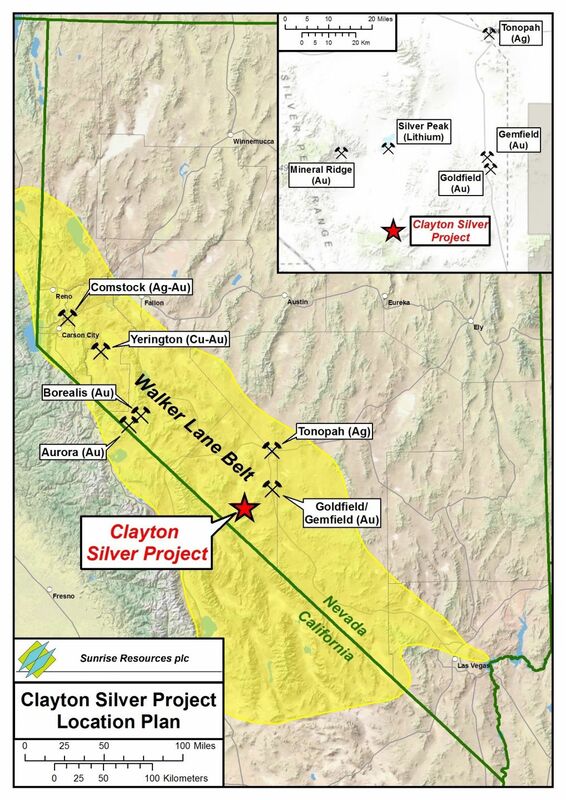 Wide intervals of low-grade silver mineralisation were intersected in all holes. The available record of Coeur’s drill programme is incomplete but it is clear that Coeur did not follow up the important drill intersection made by Freeport in Hole CL-15. Following evaluation of the historic exploration results Sunrise Resources considers that a programme of diamond drilling is now warranted including a twin and step out from drill hole CL-15.